The yearly Spike Video Game Awards have been, so far, mostly an excuse to get some celebrities to read a teleprompter telling us how much they love video games as though anyone gave a hoot about that. There would be some nice reveals of upcoming games here and there, but really it was about having some people who really sounded like they have never touched a game in their life talk about how much they love video games before introducing the winner of some award for a category created to appeal to bros. This year sounds like it’ll be pretty different, actually, in a good way. Oh, and it airs tonight. While its roots lie in the Video Game Awards, VGX will abandon the traditional Hollywood style award show to feature more world premiere game trailers than ever before, plus extended deep dives into the next generation of games, new looks at gaming culture, one-on-one interviews with the industry’s most visionary creatives and expert panels digging into what’s coming to consoles in 2014 and beyond. The new format features more games, less fame, in an intimate studio setting, and the live stream will be hosted by Joel McHale and Geoff Keighley. This year marks the tenth anniversary of the award show, and it will be the first to have separate online and televised components. Tonight, there will be a three hour live stream on quite a few websites and devices, and on Monday, Spike will distill that all down into an hour to broadcast on TV. Like before, there are several “premieres” of games to be shown off, this year including Titanfall, Quantam Break, The Witcher 3: Wild Hunt, and Tom Clancy’s The Division. Reggie Fils-Aimee will also present a “new look” at an upcoming Wii U game. VGX will air today, December 7, at 6:00PM EST / 3:00PM PST. If for some crazy reason you’d rather wait to watch it on TV, drink a few extra cups of coffee on Monday to stay up for the shorter, one-hour version that airs at midnight EST. VGX, the next generation of Video Game Awards, is an all-day gaming experience, and a true binging dream for gamers. VGX will be an interactive experience with Twitter as the exclusive social media platform enabling viewers to have a direct impact on the stream by voting on show order and unlocking additional content. Fans will also have unprecedented access to the industry’s top developers and talent with LIVE Q&A interviews powered by Twitter. VGX unveiled its first wave of world premieres that will be debuted during the three-hour live stream including exclusive new looks at “Titanfall,” “Quantum Break,” “South Park: The Stick of Truth,” “Broken Age,” “Dying Light,” “Tom Clancy’s The Division,” and The Witcher 3: Wild Hunt.” VGX will also feature Nintendo of America president Reggie Fils-Aime presenting a new look at an upcoming Wii U game. You can also tune in to the VGX Pre-Play for an exclusive look at Square Enix’s “Thief,” starting at 5:45 PM ET/ 2:45 PM PT. VGX Nominees are determined by the VGX Advisory Council, which is made up of a group of some of the most well-respected video game journalists from media outlets such as Entertainment Weekly, Game Informer, Joystiq, Kotaku, Polygon, IGN, GameTrailers, Gamespot, Wired.com, USA Today and Associated Press. VGX will be streamed across Xbox One, Xbox 360®, PlayStation®3 (PS3™), Twitch, iOS and Android devices, and available globally on VGXLIVE.com, Hulu, Yahoo Screen, the Yahoo Screen app and Viacom properties Spike.com, ComedyCentral.com MTV.com, MTV2.com, BET.com and GameTrailers.com. 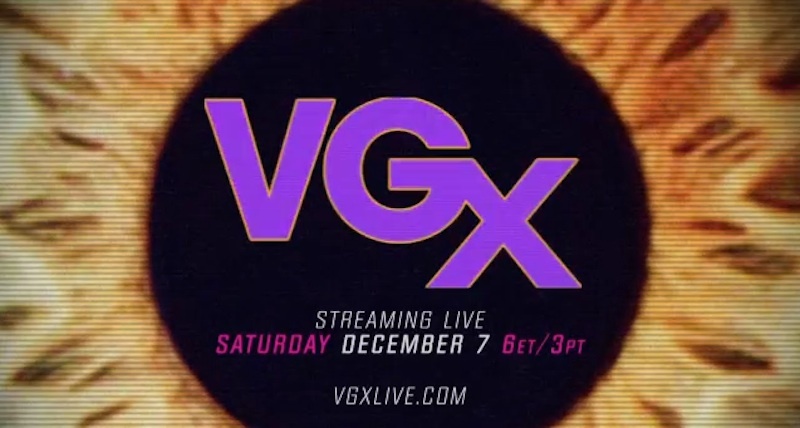 VGX will be live streamed for three-hours on Saturday, December 7, beginning at 6:00 PM ET / 3:00 PM PT. Spike TV will also air highlights of the show as “VGX Replay” on Monday, December 9 at midnight.